The Ferrari F355 is a beautiful car, and for those of you with exotic dreams but modest means you can have one in your driveway for as little as $60,000. But depending on the condition, you may need a hefty savings account just to keep it on the road, as these fellows just found out the hard way. This bright-eyed bushy-tailed young man from JR Garage—and by young I mean less than 20 years old—did what a lot of young people do at his age and fell in love with a fast but unreliable car. He scored an F355 and has been documenting his experiences with it on his channel. In this video, he tallies up the maintenance costs between the previous owner and himself over just a 1,000 mile period. Between two five-figure engine out services, new tires all around, servicing the sophisticated but pricey “F1" transmission, and more, the damage came out to $37,735.64. And of course, more is coming because it always is. Now it’s not like we didn’t warn him. 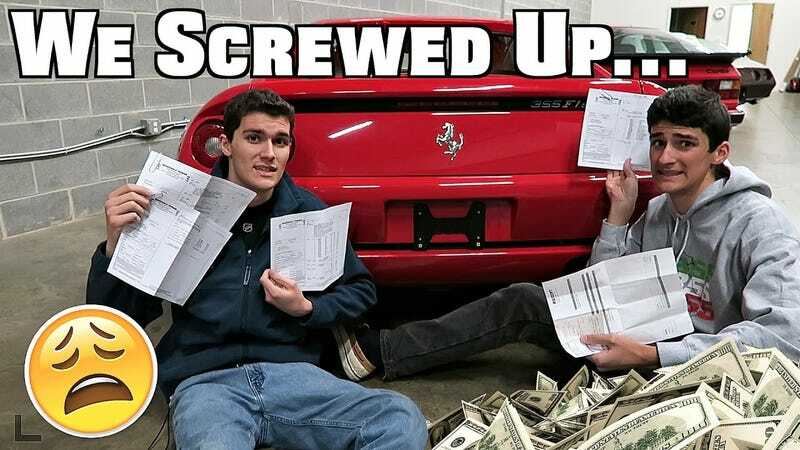 Nissan S-Cargo enthusiast and former Ferrari 360 owner Doug DeMuro made it very clear that a Ferrari 355 despite its somewhat affordable entry cost is one of the most expensive modern Ferraris to maintain. Well, you know what they say: better to have loved a F355 and lost all your money, than never to have had a Ferrari at all.